1. What is a Gargoyle ? A Gargoyle is a carved stone character used for drainage purposes to the side of a building. 2. What is its purpose? It is to prevent rainwater from a roof of a building flowing down the side walls, so it does not erode the mortar joints and damage the fabric of the building. There is usually a channel in its back or through the stone and this directs the flow of water to come out of a specific aperture, normally the mouth. The rainwater runs off from the roof and is projected several feet from the walls thereby protecting the mortar and walls. The bigger the gargoyle, the further the water is ejected from the side of the building. 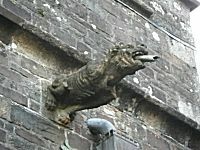 A lead pipe was often placed in the gargoyle’s mouth to extend the reach and protect the carving from erosion. 4. Why is it called a Gargoyle? 5. When were Gargoyles first used? This is unknown. We know that they were used in Ancient Egypt (usually as Lion Heads). We also know that they were used on the Temple of Zeus on Olympia constructed about 470 BC, where nearly 40 gargoyles of the original 100 or so are still identifiable. 6. What are the most famous Gargoyles in the World? Probably those on the Notre Dame de Paris on the Ile de la Cite, which feature in the “Hunchback of Notre Dame” and have been photographed by many thousands of people. 7. Where am I likely to see Gargoyles close by? 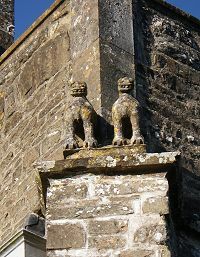 Any medieval building is likely to feature gargoyles. Probably local churches are the most likely place to spot them. 8. What do the figures that are carved mean? Some figures mean a lot and were used to help ward off evil spirits and similar and to show that within the church you were protected from the evil outside. At the time of construction of most churches, the majority of the population was illiterate. Some of the figures were used therefore to provide a permanent visual statement to the parishioners. Some were purely decorative and on some stately homes these identified the family’s heraldic animals or reputations. 9. Are all Gargoyles animals? Not necessarily. Lots of gargoyles are “Chimeras”. These are carvings of faces which are often distorted into the grotesque and are also often a mixture of animals or mythical animals such as centaurs, harpies, dragons and griffins. They are often misshapen and distorted faces and creatures, sometimes even human. 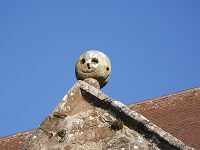 It is also undertood that on a number of Cathedrals there are relatively normal decorative faces used as one of a series of “gargoyle” features that in a few instances are reported to be the skilled stone carvers leaving behind a carving of themselves or close family members for posterity. 10. Why are some Gargoyles called Grotesques? A Grotesque is simply the carving of a face (or body and face) of an animal or creature on the side of a building which does not serve as an outlet for water run off. Therefore a Grotesque simply serves a decorative function rather than a practical one. 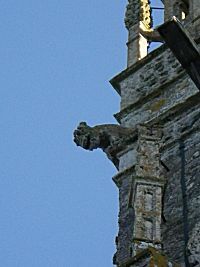 Many persons use the expression “Gargoyle” when they mean a grotesque stone carving, mounted on the side of a building.